The Avenger Heavy Duty 3 wheel scooter offers superior maneuverability and performance with so many extra features! For starters, this compact 3 wheel unit has a heavy duty frame that will carry up to 500 lbs! The 13" rear tires and 7 m.p.h. speed and 4 inch ground clearance make this the ultimate heavy duty 3 wheel scooter for traveling over rough terrain, or maneuvering in smaller spaces indoors. The comfortable, high back captains seat offers an adjustable head rest and a semi-recline lever to give the maximum in comfort. The 110 amp programmable controller gives added power. All of these features, and many more at an incredible price! 500 lb. weight capacity with 4" ground clearance and 13" rear wheels! Front headlight and basket are standard. 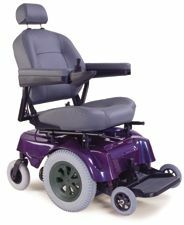 Flip-up, width adjustable arms and safety seat belt are standard. Rear Wheel Drive 24 Volt DC, sealed transaxle. 24 Volt, DC 4 pole motor with sealed transaxle. Weight w/o batteries 248.5 lbs. 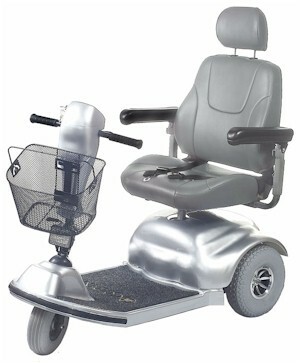 High back, swivel, height adjustable contoured captains seat with headrest. User friendly console with key start.